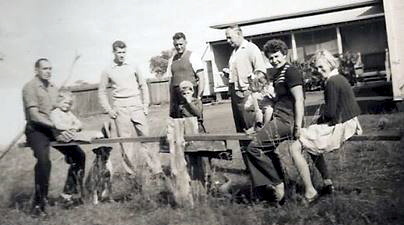 Jack Doughty in centre – taken at back of Coolabah Police Station. On left on the seesaw is Bob Doughty, next standing is Alan Doughty and in the middle is Jack Doughty. Thank you very much for letting me know of Ken Astill’s passing. Ken was a friend of the Doughty family, through my uncle Jack Doughty, who for many years was a serving Police Officer at Coolabah. Many years ago when I was a teenager, Ken, Jack, the Doughty brothers and myself, went on many pig shooting expeditions around Coolabah. I am attaching a photograph of Ken taken with my Uncle Bob Doughty and also a photograph of the Doughty family at the back of the Police Station at Coolabah. When Uncle Jack retired be and his wife Joan, lived at the back of Manly Lighting on Pittwater Road in Manly, where Joan worked as the company’s Bookkeeper. Jack passed away in 2006 in Manly Waters Private Hospital aged 81. At this time he was living in Narrabeen at the Anzac Village. I know that Jack was still in touch with Ken, while he was living in Manly, I am not sure if Ken was at the Anzac Village at the same time as Jack.